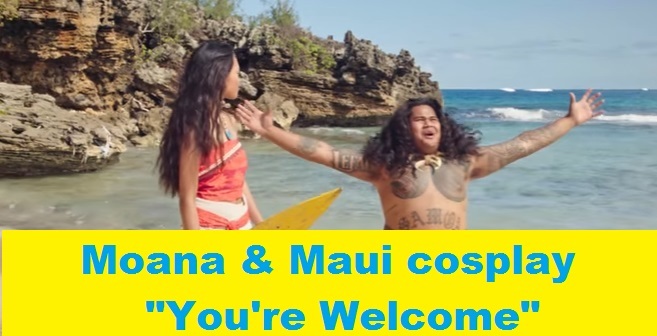 Live-Action Disney's Moana Cosplay Music Video : Maui Sings "You're Welcome"
I absolutely loved Moana. If you guys haven't seen it, you definitely should because it is worth the watch. Moana is about a Polynesian princess who is destined to protect her people, but she uncovers secrets about the myths within her culture and hidden potential that she has in order to help her people thrive even further. She ends up meeting the demigod Maui and they embark on a journey to save the Polynesian tribe as well as each other. So I love it when I see people cosplaying characters from movies and recreating scenes from movies. I cam across a live-action recreation of the song "You're Welcome" where the demigod Maui tells Moana, "You're welcome for all that I have done for you.."
In the video, Maui is played by MJ Matau and Angeline Madriaga as Moana. So what did you guys think of this recreation? Let me know what you think by leaving a comment down below! Also don't forget that you can purchase Moana on DVD and Blu-ray right now.